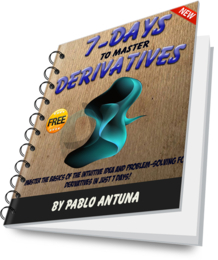 In this page you can sign up to Intuitive Calculus Free eCourse. With this course you will learn calculus in the intuitive way, step by step. Since I started offering this free course, more than 3000 people have benefited from its intuition-first method, with special focus on problem-solving techniques. This is a serious multiple-part calculus course. The lessons provide links to external resources and videos whenever appropriate. A new lesson will be delivered to your e-mail inbox every day during the duration of the course. You can unsuscribe at any time, although I doubt if you'll want to once you realize the true value of the course. P.S. : I prepared two special gifts for you after you sign up.